I wait for the craziest and wildest captions that you can imagine! Sensible lady: Er, some other time? Wife: "It may be a good idea to take the dentures out of the glass before putting them in your mouth!" If we call a giant with one eye A CYCLOP how do we call a giant with only one tooth ? I am the best glass blowing artist of the world ! 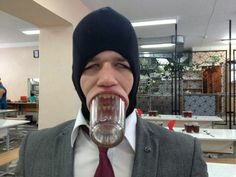 I�ve heard of a "gas mask", but never a "GLASS mask"? This can�t be a gas mask. Everybody knows they also cover the nose. This device has been proven to be the most effective in addiction treatment processes for alcohol and smoking altogether. Could be a LOLLYGLASS ! What happens when wife catches me trying to eavesdrop on her conversation from the next room.